The OM-CP-LYOTEMP data logger is designed for use in ultra-low operating temperatures for processes such as lyophilization. The OM-CP-LYOTEMP has an operating range of -60 to 75°C (-76 to 167°F), and is designed with a hermetically sealed thermistor temperature sensing element in a long thin flexible cable form, making it ideal for monitoring products during the lyophilization process. This data logger offers a smart, affordable solution for a wide range of applications including the preparation of biological pharmaceuticals, monitoring plasma and red cell freezers or dry ice shipments. The compact size and simple operation make the OM-CP-LYOTEMP user friendly and reliable. This data logger has three LED indicators to alert or inform the user of the logging status and manual start and stop options available at the device. Other features of the OM-CP-LYOTEMP include delayed start configuration, real-time recording, user configurable alarms and password protection. The OM-CP-LYOTEMP requires minimal maintenance and with average use will require annual calibration. The OM-CP-LYOTEMP utilizes a USB docking station (sold separately), to communicate with a personal computer or laptop. 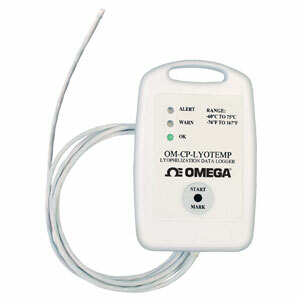 The OM-CP-LYOTEMP provides date and time stamped temperature readings. Our easy-to-use Windows® software does the rest. The user can view the data in graphical or tabular form. High and low alarm limits and high and low warning limits can be programmed through the software. Other software features include: multiple graph overlay, statistics, digital calibration, zoom in/zoom/out, lethality equations (F0, PU), mean kinetic temperature, data annotation, min/max/average lines, data table view, automatic report generation and summary view. The OM-CP-MICRODISC is a surface temperature probe attachment designed to be used with the OM-CP-LYOTEMP data logger. This rugged disc probe attachment is made of brass and is formed to connect directly to the tip of the OM-CP-LYOTEMP’s thermistor temperature probe. The OM-CP-MICRODISC is specifically designed to give the user the ability to perform processes that require surface temperature monitoring. With its compact size, puck like shape and wide operating range, the OM-CP-MICRODISC allows for close contact with flat surfaces ensuring accurate temperature monitoring of shelving during the lyophilization process. The OM-CP-MICRODISC is fitted with a silicone rubber insert that secures the probe connection throughout the data logging process. Start Modes: Software programmable immediate start, delay start up to 30 days in advance or manual start with magnetic switch. Alarm Delay: Software programmable time delay for warn/alarm limits. Logger will not indicate out of range status until the temperature has been out of range for a set period of time. Nota: Comes complete with 3.6V lithium battery. Operator’s manual is included with the OM-CP-IFC300 Windows software, docking station and USB cable (required to operate the data logger and sold separately).